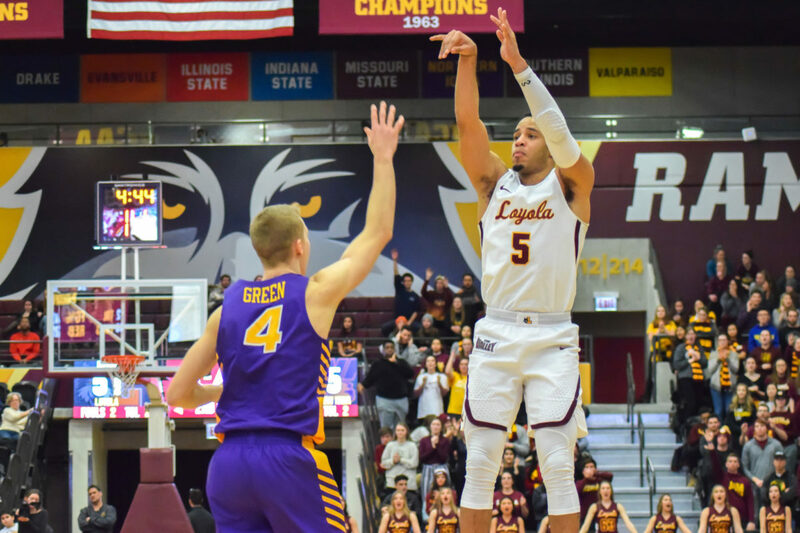 Tim Edmonds | The Phoenix Loyola redshirt senior guard Marques Townes shoots a three-pointer against UNI Jan. 30. 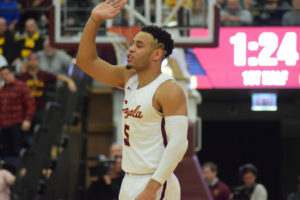 The Loyola men’s basketball team (16-10, 9-4) fell to Bradley University 61-54 at Carver Arena in Peoria Wednesday night. Redshirt senior guard Marques Townes led the Ramblers in scoring with 15 points while sophomore center Cameron Krutwig put up another double-double, scoring 13 points and grabbing 11 rebounds. Loyola took a 26-22 lead into halftime. But the Braves owned the second half, outscoring the Ramblers 39-28 to complete the comeback. The Ramblers are next scheduled to take on Missouri State University at a sold-out Gentile Arena Feb. 17. Tip-off is scheduled for 3 p.m. and the game will be broadcasted on ESPNU.